All hail West Texas, land of slick rich quick schemes and rural desperation. Rarely has a crime caper placed such emphasis on the decay of the contemporary American West. ‘Three tours in Iraq but no bailout for people like us’, reads a tag in the opening shots of David Mackenzie’s gritty tragedy. 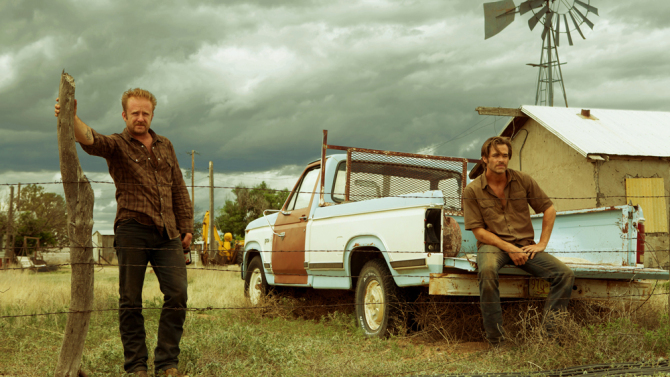 Ben Foster (playing a black sheep Ben Foster type), and a distractingly handsome Chris Pine (playing Josh Brolin from No Country For Old Men) are Hell & High Water: Fiercely affectionate good ol’ bros; authentic American antiheroes who communicate exclusively in Brandoesque growls. Everywhere the camera turns, under beautifully expressive plains clouds, ‘Closing Down’ and ‘Debt Relief’ signs war for attention with the ramshackle landscape of White American poverty. This is a land plagued by bush fires, debt and televangelists. Foster & Pine have turned to crime to save the family farm from the iron sights of cartoonishly venal bankers. But in West Texas even the banks are closing, victims of forces beyond the ken of local desperation. Jeff Bridges, playing Tommie Lee Jones in No Country for Old Men, is weeks from retirement – he’s holding a ‘mandatory retirement letter’ his first moment on screen. This grizzled veteran rarely sleeps. He passes time drinking and ribbing his Mexican / Native American partner, who muses on the irony of bankers stealing farms from the descendants of those who stole from his ancestors, ‘Far enough back we’re all Indians’. Foster and Pine speed across the shuttered landscape re-enacting Dukes of Hazard in disposable muscle cars. A pair of mismatched cowpokes who listen to country music and sport two-week shadows, they’ve come together one last time to fight the march of history. As modernity and finance sweep away the free-holding West, the brothers enact a series of increasingly bungled robberies. Pursued by their mirror images – Bridges and his native scout punching bag, and by possies of open carry enthusiasts in ten-gallon hats, their capture seems inevitable. They know it, ‘the days of robbing banks and trying to live to spend the money they’re long gone’. Hell or High Water is at it’s weakest when it reaches for a message. While the setting evokes a very modern melancholy, the film is too glossy, pat, and its script too one dimensional to say anything about contemporary America. At its best Hell or High Water doesn’t shy away from the brutality of the path Pine & Foster have chosen, or the cheapness of the glamour it temporarily affords them: A grudging respect from locals who’ve been here ‘long enough to see a bank get robbed, been robbing me for thirty years’. Does it do more than replicate the look and feel of worthier Coen Brothers joints? Perhaps not. But with cinematography that references classic Westerns, an affecting if paint by numbers storyline, a sweetly melancholic soundtrack, and watchable lead performances, it passes the time. The cast is so good that any issues in the plot to be found, were easy to get past. Nice review.